Left: The kitchen dining area, with its gingham-covered communal table, is used by staff and large groups. Right: Disfrutar’s gastro-bar faces onto a busy street just steps away from the renovated Ninot Market. The bustling kitchen gives way to a bright, airy dining room that leads to a spacious patio. Chairs by Barcelona manufacturer Lobster’s Day. Left: To reach the main dining area, guests traverse a narrow, tile and steel-clad corridor between the open kitchen and the prep station. 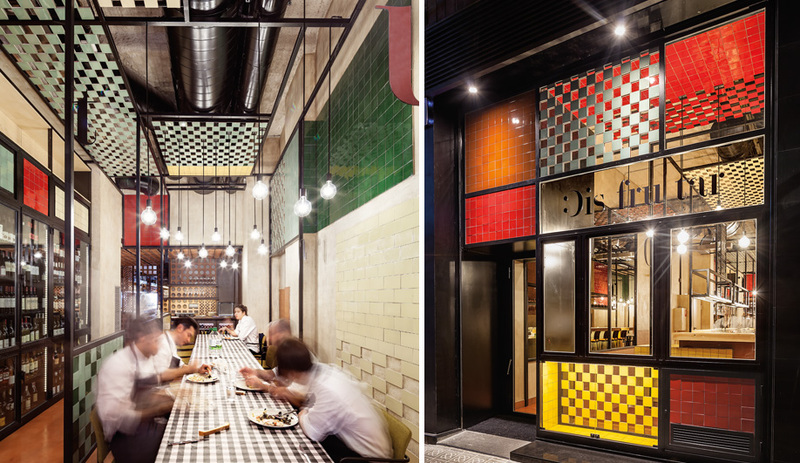 Right: El Equipo Creativo used red and white lattice tiles, sourced from Cerámica Ferrés, to cover the walls and ceiling. 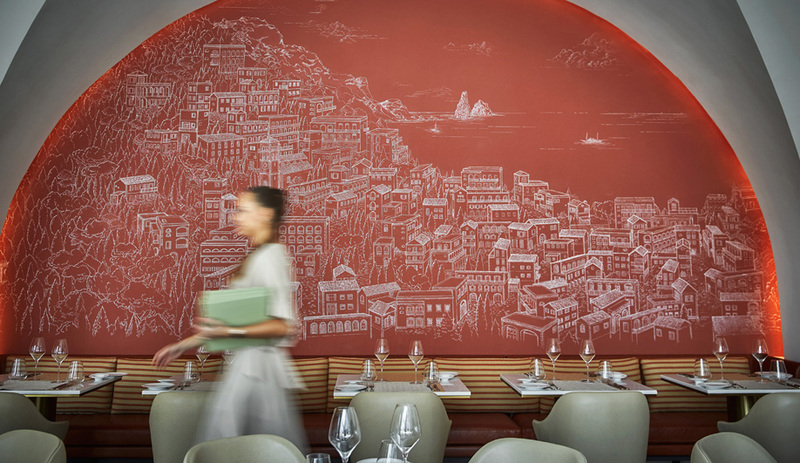 The menu, created by chef Ferran Adrià, serves molecular gastronomy with a Mediterranean twist. 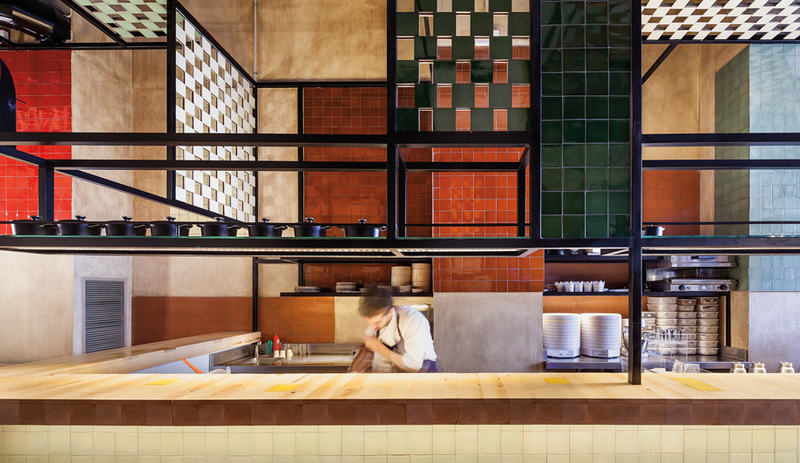 For the new molecular gastronomy restaurant run by ex-El Bulli chefs, El Equipo Creativo gives the interior a humble – yet eclectic – look with walls made of ceramic tiles and exposed grids. Disfrutar means “to enjoy” in Spanish. It’s an appropriate name for a restaurant that encapsulates several aspects of the original modernist city plan for the area. The Eixample district of Barcelona was originally mapped out in the 1850s by urban planner Ildefonso Cerdá, but in its built form it never turned out quite as he envisioned. It’s never too late to attempt to right a wrong, however. Local firm El Equipo Creativo seems to have taken Cerdá’s vision to heart when it designed Disfrutar. 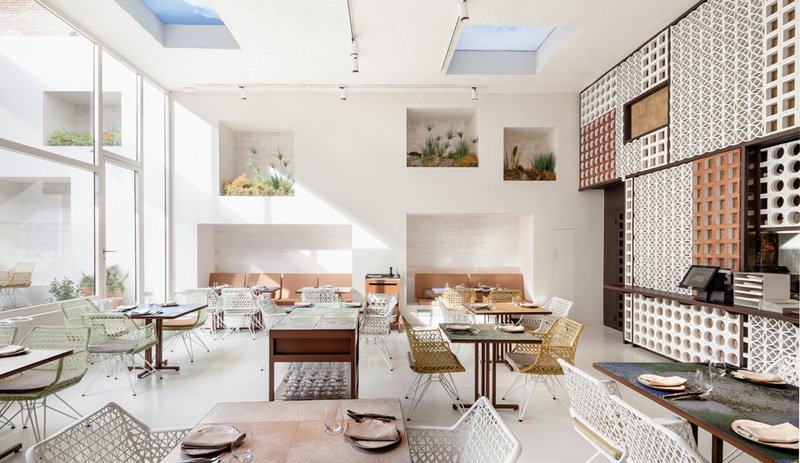 The architecture studio, run by Oliver Franz Schmidt, Natali Canas del Pozo and Lucas Echeveste Lacy, has carved an outdoor patio from the middle of a city block to create an adjoining dining room defined by natural light and spacious exterior views. The colourfully tiled front bar and the winery belong to busy Villarroel Street, directly across from the Ninot Market, which was recently renovated by architect Josep Lluís Mateo; Cerdá had designated the market as the heart of the neighbourhood. The patio and the main dining room, by contrast, are sanctuaries of calm. The two opposite realms are phys­ic­ally separated by a large, busy open kitchen that must be traversed via a dramatic corridor lined on all sides in perforated ceramic partitions. Here, the varied grids of solids and voids vaguely recall the figure-ground patterns of different cities. 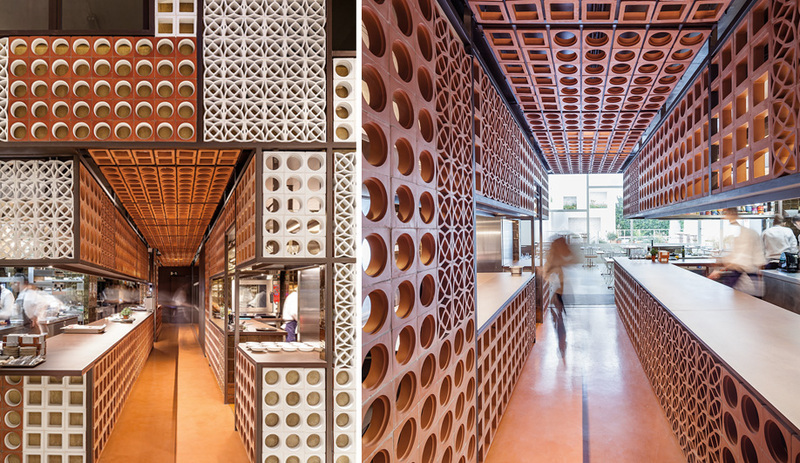 The multicoloured tile and terracotta screens veil the served from the serving spaces, while still permitting light and glimpses to penetrate, just as, at the urban scale, Cerdá’s plan sought to separate public greenery from streets via semi-open perimeter blocks. 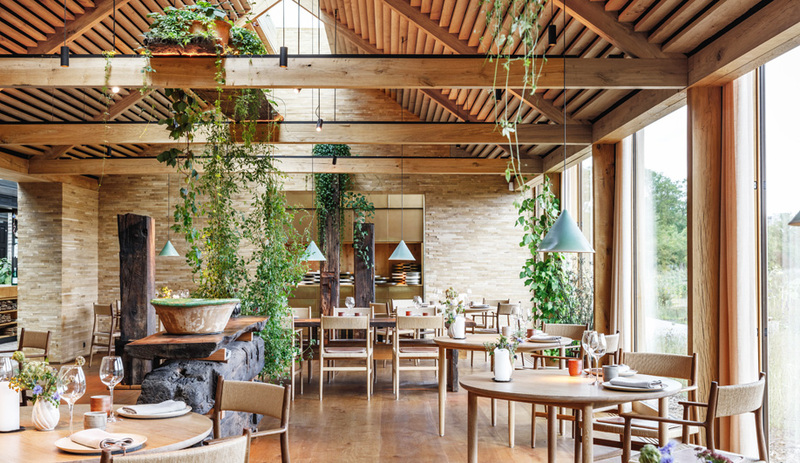 The interior gradually becomes imperceptibly wider toward the back, making the main dining room – which seats up to 50 at various-sized tables – suddenly appear vast and spacious upon arrival through the kitchen corridor. Five-metre-high white side walls, incorporating window-sized niches for plants, flow seamlessly out to the patio, creating visual continuity between the interior and the exterior. This sense of surprise echoes the dishes served, which at first glance appear to be typical Mediterranean tapas, but upon first bite reveal something completely different and unexpected in terms of aroma, taste and texture. 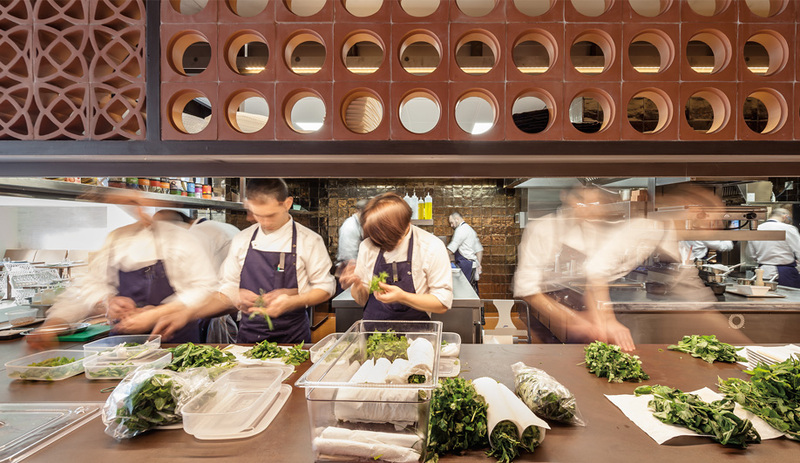 Each dish is a unique work of molecular gastronomical art à la chef Ferran Adrià, with whom Disfrutar’s chefs have collaborated. 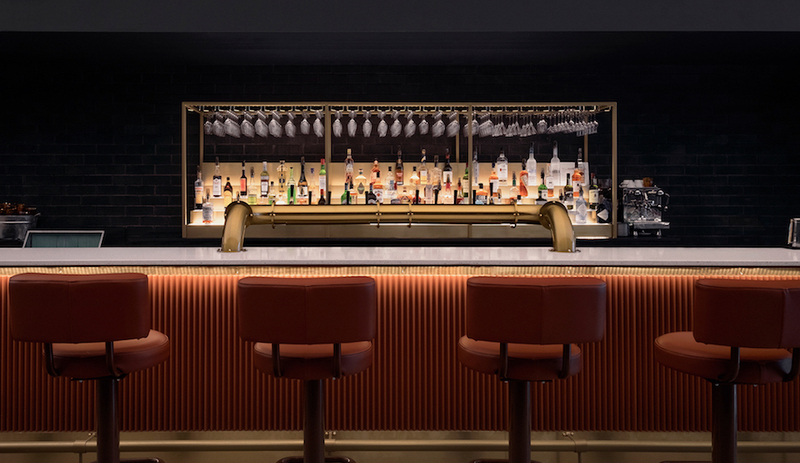 While El Equipo Creativo may not have been consciously tapping the urban plan of a century ago, the design delivers sensual pleasures at a highly refined scale. Just as Cerdá envisioned, it concentrates the sun, space and green for metropolitan Barcelona within a layered, screened and surprising interior. Disfrutar is located at Carrer de Villarroel 163, Barcelona, Spain.